Poached from fellow blogger Bob Purse, this seemed an appropriate post for Easter weekend, a brace of crucifixion-themed cuts from the Halmark song poem stable. I’ve written about Halmark before, but like the fable of the resurrection, it’s a story that is worth repeating: one of the cheapest (and consequently for the bad record enthusiast, one of the best) outfits in the field. Set up by Ted Rosen, almost all of Halmark’s output sounds as if it was recorded in the 40s or 50s; the entire catalogue is stuffed with sloppy, nonsensical lyrics and overwrought performances, and the performers are seldom credited. Ted Rosen grew up in Boston spending his time, according to his son Jeff (who still runs the company his father established) with ‘a smile on his face and his head up in the clouds, writing new songs every day’. Moving to New York in pursuit of his dream of working as a full-time songwriter, his first break came when he wrote the children's song Herkimer The Homely Doll. Released by Sterling Holloway (the voice of Winnie the Pooh) on Decca in April 1954 Jeff would have you believe that ‘it ran up the Billboard charts’; it didn’t, but you can’t blame a son for being proud of his dad, and it was at least featured on the hit kid’s TV show Captain Kangaroo which began its record-breaking thirty year run the following year. Ted also claimed to have written a hit song for Rosemary Clooney, but if he did she doesn’t appear to have recorded it at any point during her career. He wasn’t a complete shyster though: Ted did write I Remember Mambo, a 1955 release by actor and singer Jack Haskell, and another song he co-composed (Too Late by Eddie Singleton and the Chromatics) was picked up by Brunswick for major distribution after it appeared on Rosen’s AMSCO label. Like Jack Covais (Tin Pan Alley) and Lew Tobin (Sterling), Ted Rosen would often give himself co-credit on his companies’ song-poem releases. What sets his companies - Talent Incorporated, Halmark (occasionally appearing misspelled as Hallmark), Grand, AMSCO and Chapel - apart from the others though is the otherworldly quality of their productions, caused mostly because instead of using live musicians (a la Preview, Columbine, Tin Pan Alley or MSR) the company instead utilised a series of recorded backing tracks, or music beds as they're often known, for their recordings, employing the same backings again and again and again. This means that the same music track would appear as backing to a political song on Halmark, an overwrought ballad on Grand and as the tune to a hymn on Chapel, for example, and good old Ted he didn’t care how often these tracks were used. It made life simple for his small stable of vocalists: all they had to do was walk into the studio, have a quick squint at the lyric sheet, and fit the words as best they could around a track they had heard time and time again. 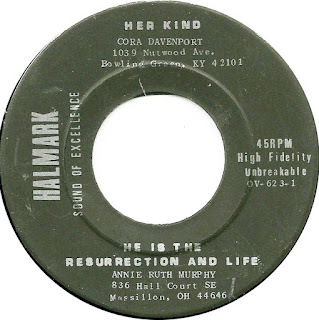 Anyway, just in time for you to enjoy your eggs and hot cross buns, here are the (as usual) uncredited Jack and Mary Kimmel with a pair of typically terrible Halmark cuts: He is the Resurrection and Life and From the Manger to the Cross. We had a couple of friends down last week, always a good excuse to go trawling around Bristol’s many secondhand stores and charity shops in search of vinyl bargains. I picked up a few handfuls of rubbish: some not quite as awful as their covers or titles seemed to promise, but a few delights I shall endeavour to share with you over the coming weeks. 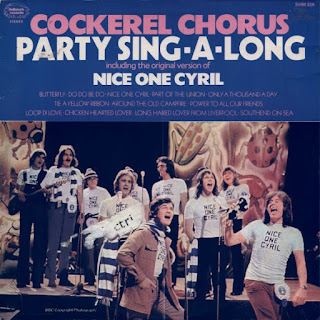 One of the albums I picked up was the thoroughly atrocious Party Sing-A-Long by the Cockerel Chorus, a ragbag group of footie fans who had scored big in the UK charts with the Tottenham Hotspur chant Nice One Cyril. Written by Spurs fans Helen Clarke and Harold Spiro, Nice One Cyril was written to celebrate Tottenham’s much-loved left-back Cyril Knowles, and reached number 14 in the UK singles charts. There is a story that Iron Maiden’s Nicko McBrain is drumming on the single: maybe one of you can tell me if this is true or just an urban legend. The Cockerel Chorus was fronted by Spiro and Jamie Phillips, who sings the faux-operatic intro to the song. Harold was a season-ticket holder at Spurs and a noted songwriter – co-authoring songs for the Yardbirds, Peter Noone, Tina Charles, Olivia Newton-John, The Troggs and Georgie Fame amongst others, and TV theme music for Kenny Ball and dog trainer Barbara Woodhouse. Of course he also wrote the horrific David ‘Diddy’ Hamilton song Just Like That, which I featured here a couple of years ago. Party Sing-A-Long is a horrible album, with yobbish cover versions of recent hits including Long Haired Lover from Liverpool, Tie a Yellow Ribbon and Part of the Union, but the worst has to be the awful cover of Loop Di Love, which had been a hit for serial offender Jonathan King (as Shag) in 1972 but which had originally been a hit in Germany for J Bastos (aka Rolf Steitz) in 1971. Who in their right mind would have thought to throw this on the turntable to turn their flagging party around? 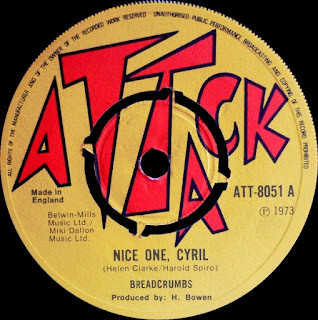 As a bonus, I also present to you both sides of the Breadcrumbs reggae version of Nice One, Cyril. Possibly one of the dumbest reggae records of all time, this atrocious slab of cheese was issued in the UK on Trojan’s Attack Record imprint in 1973. The kazoo solo is priceless! Thanks to discogs.com for the photo. Some time in the not-too-distant past, an anonymous record collector stumbled upon what is reported to be the only copy of this tosh. Sharing it around the net, it was (unsurprisingly) picked up, re-ordered and reissued in a new sleeve in 2002, almost 30 years after it was originally recorded. As often happens, certain lovers of the perverse decided that this was a great lost work of lo-fi loveliness, and feted it as the UK's ‘rarest 70's esoteric stoner-folk album’. Since then people have been raving about how great this is. Well, I have a surprise for you: it’s not great at all. Supernatural Girl by Ferris Wheel is not a great folk-psych masterpiece, it is inept, badly-played and poorly recorded hokum. 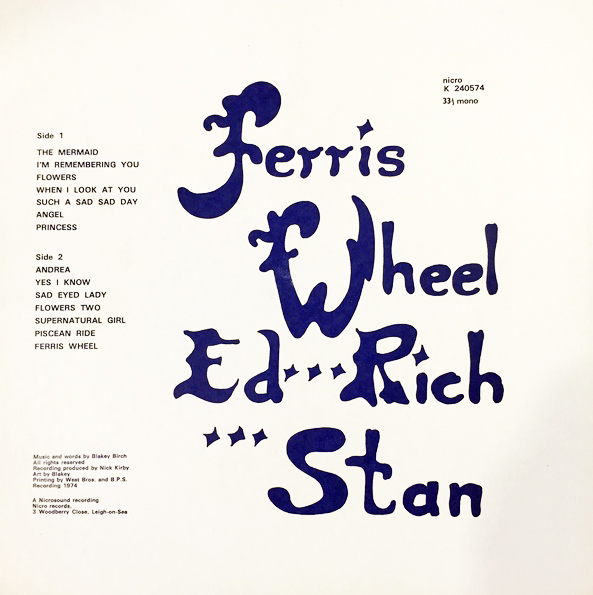 Seemingly the only record issued on the Nicro label (part of Nicrosound, of Essex costal resort Leigh-on-Sea), the three-piece Ferris Wheel (Ed, Rich and Stan) sound like a parody of bad folk musicians. You could easily believe that this is the only album owned by the Flight of the Conchords, or that this was the record that Ralfe Band were trying to emulate when they made the sublime and wonderful Swords, but seriously – it’s dreadful. That said, it does have a certain naïve charm. 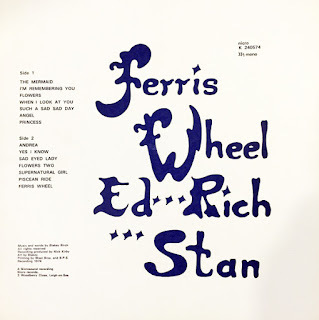 The songs, written and copyrighted by the otherwise unknown Blakey Burch (as credited on the label: on the original front cover his/her surname is spelled Birch) and produced (ha!) by Nick Kirby, are outrageously amateur: When I look at you/I know you’ll be true/And I will not be blue… and Piscean Ride is easily one of the most awful things that I have ever had to endure. The guitar and bass remind me of the (virtually) unlistenable Beatles/Stu Sutcliffe Cavern rehearsals, it’s that bad. The Mermaid – on which our trio don their skiffle shoes – is dire, and the guitar playing on I’m Rembering You is truly execrable. Although the Ferris Wheel and Birch/Burch are entirely unknown, Kirby is someone we do know something about: a DJ on Radio Sutch, a short-lived 1964 pirate station in the Thames Estuary fronted by our very own Screaming Lord Sutch, Nick was born in 1944. Originally blind, groundbreaking eye surgery in his pre-teen years restored some sight although, sadly, his eyesight failed completely in later years. Nicrosound was his company: specialising in jazz, Nicrosound also put out tapes by Digby Fairweather and the Les Page Dixieland Band. Nick sadly passed away in 1994 from a brain haemorrhage. You can find out more about him and his pirate radio career here. Described as ‘timeless, downer-style electric folk brimming with tension and despair’, you can find the whole album on YouTube, but here’s a taster – three tracks from the otherworldly Supernatural Girl. I don’t really know what to make of this – it smacks of novelty release, yet I can’t really see the market it was aiming for. What it actually is is a desperate stab at chart success from a singer and songwriter who had been treading the boards for over a decade and who, frankly, should have known better. Cresceno, by Hazel Gummage, was written by Manfred Mann singer Mike D’abo, and originally recorded (as Love is Like a Crescendo) by Cliff Richard in 1969, although it remained unreleased until 2008. 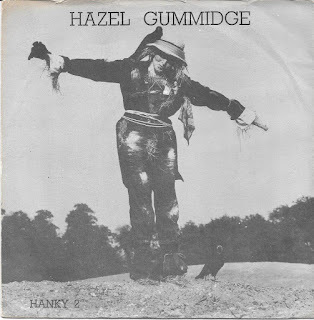 Backed with Get Back to the Country, Hazel Gummidge is actually Bristol-born singer and songwriter Aj Webber. Born in December 1948, she started playing guitar in local folk clubs around the age of 13, becoming one of the residents at the Bristol Troubadour. Webber then turned professional, working the cabaret circuit under her given name Adrienne. As Melody Maker put it: ‘she has the abilty to perform, entertain, captivate and ‘win’ audiences’, and she would go on to work with artists such as Paul Simon, Crosby, Stills, Nash And Young, Gordon Lightfoot and the Everly Brothers. She played regular dates at the Marquee in London and worked with acts as diverse as Cockney Rebel, Kraftwerk and Frank Zappa: Aj opened for The Eagles at the height of their fame in Europe. Her first album – Aj Webber (aka Rhyme and Time) - included guest artists such as Albert Lee, Gerry Conway and Michael D’Abo, the author of Crescendo. 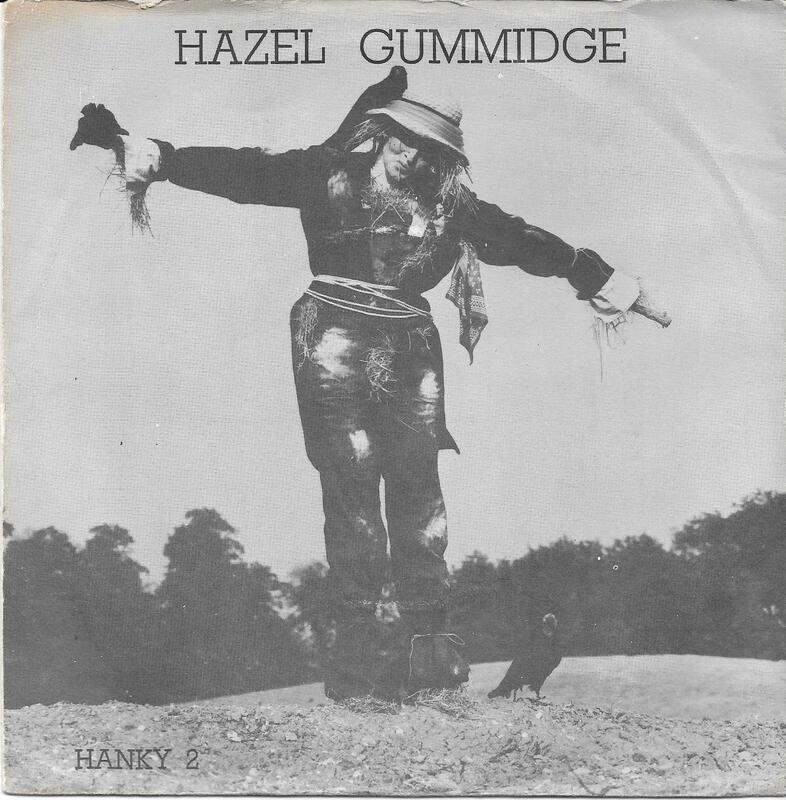 This single, issued the year before her debut album in 1975, drew heavily on Aj’s West Country accent for ‘comedic’ effect, on novelist Barbara Euphan Todd’s beloved scarecrow character Worzel Gummidge and on Aj’s homophonic connection to Adge Cutler and the Wurzels: she picked up her nickname – employed, she told the News of the World, because there was a stripper working in Bristol called Adrienne and her gigs were starting to attract the wrong crowd – as Cutler and Webber were both part of Bristol’s then rather expansive folk scene. Worzel Gummidge first appeared in print in 1938, but reached a much wider audience in the mid 70s, thanks to several of the stories being adapted or the popular BBC kid’s show Jackanory. Although the sleeve looks as if she is aping Jon Pertwee, who played Gummidge on TV from 1979-1981, Cresceno appeared four years before the former Doctor Who donned his thinking head. Releasing four albums over her career, Aj Webber also made appearances on television programmes as diverse as The Cliff Richard Show and The Old Grey Whistle Test, and for a number of years worked as a DJ for radio stations GWR and BFBS. Now living in France and planning a new album, during the mid-80s she took a break from music to raise a family, but continued to write songs. Many of these songs appeared on her last album of original material Running Out Of Sky.